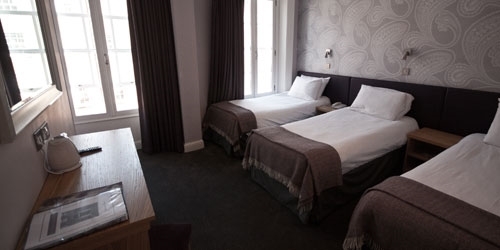 Our Superior Triple Room consists of a double bed & a single bed and accommodates three guests. These rooms have been furnished and decorated to the highest specification. All are en-suite with power showers as standard and some have a bath. Facilities: ●Free WiFi ●Multi-channel TV ●Tea/Coffee Making Facilities ●Shower & Bath ●Complimentary Bottled Water ●Complimentary toiletries ●Hairdryer ●Telephone ●Wake Up Service/Alarm Clock ●Safety Deposit Box ●Stay 2 nights save 10%.